A Whole New Level of Dominoes! 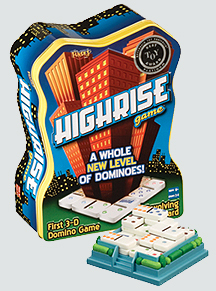 Highrise is the first family domino game that plays vertically! A totally unique set of dominoes includes wilds and clear spacers to help you build up toward an unpredictable finish. Each floor you build multiplies your points by that level. When all plays are exhausted, the Highrise is complete and the player with the most points wins! Highrise features a revolving game board that gives each player a view from all angles. Highrise is a challenging game of three dimensional fun that is great for the whole family!